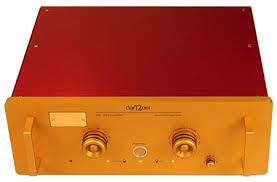 “The “stunningly transparent” darTZeel offered spectacular transient speed, resolution, and decay, while providing an overall coherence that “made recorded music, analog or digital, sound much closer to live,” said MF. Bass lacked some authority, and the sound sometimes had “a slight velvety finish.” With its warm, vivid combination of red chassis and dark gold front and rear panels, the NHB-18NS “looks like it sounds.” Its fully dual-mono design, lack of global negative feedback, and ultrawide bandwidths are meant to eliminate phase shifts at the frequency extremes. JA was “puzzled” by some aspects of the darTZeel’s measured performance, particularly the much poorer performance through the balanced inputs and outputs, but was overall impressed by the level of audio engineering. Compared to the harmonically rich Musical Fidelity AMS Primo, the darTZeel offered a more clinical sound: tighter bass, greater transparency, more precisely defined images, shorter sustain, and a diminished sense of musical flow. Compared to Einstein Audio’s The Tube Mk.II, the NHB-18NS sacrificed bass weight for greater top-end air, transient speed, and bass extension, said MF. The darTZeel matched the resolution and transparency of the mbl 6010 D while managing to sound less mechanical, said MF about his reference preamp as of summer 2008. (He bought one!) US price will depend on the exchange rate from Swiss francs. Dit bericht werd geplaatst in Algemeen info - Informations générales, darTZeel, Versterkers - Amplificateurs en getagged met dartzeel, durob audio. Maak dit favoriet permalink.